Email, Facebook, Google, Twitter, Github and the list can go as long as you wish. These are possible options for authenticating users in your web apps. Apps built with React and GraphQL are no less candidates for such authentications. We will also learn how to protect React routes from being accessed if the user fails to be authenticated by our authentication server. 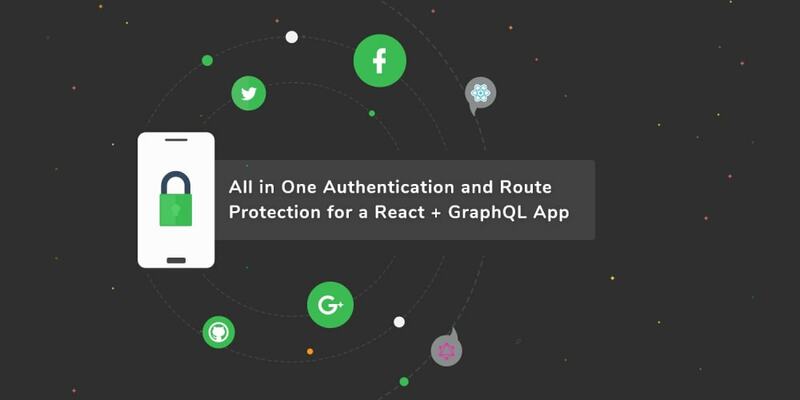 This tutorial assumes a fair knowledge of GraphQL and React as well as how authentication flow works. You can refer to my previous post on Building a Chat App with GraphQL and React to learn a few concepts about GraphQL. You can also learn about JWT authentication from one of our previous posts. Create a containers folder and add home.js, profile.js, admin.js, and about.js as files to represent each of these routes. You can add the navigation component as nav.js in the components folder as well. Before we do that, we need to setup routing for the React app and have the pages exposed as routes. Let’s step away from the client app for a second and get back to the Graphcool server we created earlier. Graphcool has a serverless function concept that allows you to extend the functionalities of your server. This feature can be used to achieve a lot of 3rd party integrations including authentication. Some functions for such integrations have been pre-packaged for you so you don’t have to create them from scratch. You only need to install the template, uncomment some configuration and types, then update or tweak the code as you wish. This will create an auth0 folder in server/src. This folder contains both the function logic, types and the mutation definition that triggers this function. AUTH0_DOMAIN and AUTH0_API_IDENTIFIER will be exposed on process.env in your function as environmental variables. You need to remove the User type that was generated when the server was created so that this auth User type can replace it. This makes the fetchAuth0Email function useless — you can remove it. We supply the mutation an Auth0 token and we get a node token from Graphcool. Let’s see how we can get tokens from Auth0. Create client Just like creating an API, we also need to create a client for the project. The client is used to trigger authentication from the browser. The application type should be set to Single Page Web Applications which is what a routed React app is. Auth Service We are done with setting up a client configuration on the Auth0 dashboard. Next thing we want to do is create a service in our React app that exposes few methods. These methods will handle utility tasks like triggering authentication, handling response from Auth0, logging out, etc. handleAuthentication will be called by one of our components when authentication is completed. Auth0 will pass the token back to us through URL hash. This method reads and passes this hash. storeAuth0Cred and storeGraphCoolCred will persist our credentials to localStorage for future use. We can call isAuthenticated to check if the token stored in localStorage is still valid. getProfile returns the JSON payload of the user’s profile. It uses the handleAuthentication method exposed by Auth to send a mutation to the Graphcool server. We are yet to setup a connection to the server but once we do and attempt to authenticate a user, this callback page will send a write mutation to the Graphcool server to tell the server that the user exists and is allowed to access resources. In the Callback component, we used the graphql (which we are yet to install) to connect the component to a mutation. This doesn’t imply that there is a connection to the Graphcool server yet. We need to setup this connection using Apollo and then provide the Apollo instance at the top level of our app. Use the Simple URI to replace the placeholder in the code above. Next we created and configured an Apollo client instance with this link as well as a cache. This created client instance is now passed as prop to the Apollo provider which wraps the App component. After authentication, watch the page move back to /callback and the /profile if authentication was successful. We only accounted for generating tokens but what happens when a user tries to access a restricted backend route? Of course, an authenticated user will still have access because we haven’t told the server about the token. You can then use the token at the server’s end to validate the request. In as much as you have done a great job by securing the most important part of your project which is the server and it’s data, it doesn’t make sense to leave the user hanging at a route where there will be no content. The /profile route needs to be protected from being accessed when user is not authenticated. We are still using auth.isAuthenticated to check for authentication. If it returns true, /profile wins, else, / wins. We just learned how to authenticate a user using Auth0 in a GraphQL project. What you can do is go to your Auth0 dashboard and add few more social authentication options like Twitter. You will be asked for your Twitter developer credentials which can get from the Twitter Developer website.